By Solidarity Halifax member Ben Sichel, originally published at no need to raise your hand. Imagine paying doctors based on whether their patients live or die, or paying social workers based on how many down-and-out clients they coach into becoming successful. These are ridiculous suggestions. Yet the same logic underlies the idea put forth in a report by the Canadian Council of Chief Executives (CCCE), a group of 150 top Canadian CEOs, which says teachers should be paid according to their so-called “performance” in the classroom. Merit pay for teachers is an idea periodically promoted by right-wing think-tanks like the Fraser Institute, who view everything through a corporate lens. But it’s hard to think of a profession in which evaluation could be as subjective, and a system of monetary rewards and punishments so damaging, as it would be in teaching. The kind of scheme proposed by the CCCE could never be fair, consistent and meaningful in the real world of teachers, let alone a productive use of public time and money. 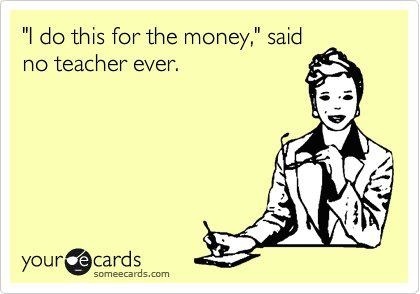 The mentality that pushes merit pay for teachers is typical of the troubling trend of corporatization in public education, which often tries to brand itself as “education reform.” So-called reformers want to base education policy on easily measurable outcomes like test scores. They push the idea that “teacher quality” is the only factor that affects student success, as if class sizes, poverty, racism, mental health problems and bullying, to name just a few issues, have no effect. But schools are not businesses; nor should they be run like them. It should be obvious that schools are so much more than testing factories, and while every teacher wants students to get good grades, we also want them to learn to be happy, healthy, empathetic, well-rounded humans. In an ideal world, these things coincide. In practice, they don’t always. If the Canadian Council of Chief Executives really wants to improve public education, there are a few things it could do. First, its members could pay appropriate levels of corporate tax, like those in place before the Chrétien era. The increased revenues could help fund public education adequately, giving relief to overcrowded classrooms and providing badly needed guidance and mental health services in schools, to name just a few things. As well, they could work toward ending the obscene levels of wealth inequality in Canada, since research has proven time and time again that poverty is the greatest impediment to student success. A simple starting step would be to close the stock options tax loophole, whereby Canadians pay over $100 million per year in subsidies to just 100 CEOs. It’s a tall order to expect a bunch of CEOs to talk about reducing their own profits and bonuses, but we can dream. Until then, scrap the hare-brained idea of making teachers compete against each other rather than collaborate, as we have always done.